to the website of the Gen-Equip project – a project combining education, primary care and genetics. Our aim is to enable health professionals who are working in primary care to update their knowledge and skills in genetics. We hope to achieve the long-term outcome of improvement in care of patients with genetic conditions or concerns. Through this website, we offer genetics education free of charge to those who want continuing medical or professional education in genetics. To ensure the education is relevant to everyday practice, the training modules are supported by a Care Bundle that includes appropriate tools and resources for use in daily clinical care. What is available for your education? Who are we? We are a group of health care professionals. To find out more about the team, click here. We all have some experience in health genetics and/or primary care and come from six different European countries. Would you like to know more about taking family history, about genetic testing, or how your patients might benefit from genetic services? Go to the webinar section of this website to view our series of recorded webinars. The material on this website reflects only the author’s views and the European Commission and Ecorys UK are not responsible for any use that may be made of the information it contains. Great news! Gen-Equip wins European Health Award! Dr Leigh Jackson travelled to Bad Hofstein in Austria to accept the award at the Opening session of the EHFG conference on 4 October. See the project leader’s response to the award. Summary of ‘Red flags’ available! Look under your own language section. 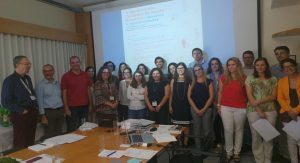 Last 9th of June, with the support of GenEquip project (www.primarycaregenetics.org) the CGPP (www.cgpp.pt) organized the Workshop Genetics at Primary Care. 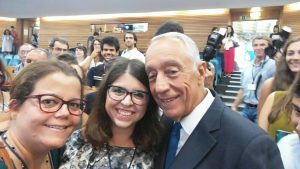 The event aimed at sharing best practice and equipping Portuguese Primary Care Health Professionals to deal with Genetics. Participants from the Ordem dos Médicos, the National Association of Primary Care Units (USF-NA), Ordem dos Enfermeiros, National Association of Nurses at Primary Care, some coordinators of internship of General practitioners, some Faculty coordinators of Medicine and Nurses, GPs, National association of interns of Family Medicine, Nurses, the National Society of Human Genetics and the College of Medical Geneticist specialists. During the workshop participants were sharing some portuguese resources and initiatives and discussed about the relevance of genetics at primary care. GenEquip modules and other relevant outcomes of the project were very wellcome among the invited professionals. The meeting ends with a debate about opportunities in practice, new strategies and common efforts. A document with all contributions will be prepare and disseminate among relevant national stakeholders. The Gen-Equip project workshop was organised to disseminate the project, obtain feedback, and create a network of interested persons to ensure ongoing support and sustainability of the educational programme. It was held at 30 Euston Square, London on 5 May, 2017. There were 61 participants from 14 European countries. Hear about the experiences of real patients. Webinars on core genetic topics for primary care. Now available in English, Dutch, Italian, Portuguese and Icelandic are now available. To do the modules in any of the available languages; go to the Module section for more detail. The modules can be taken free of charge. They were approved by both the Royal College of General Practitioners and the European Accreditation Network. They are currently accredited for CPD by the European Accreditation Network. The number of European credits attached to each module is stated on the relevant introductory page for each of the modules.